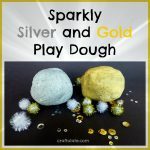 I made this sparkly play dough in shades of blue and silver and the kids loved it! 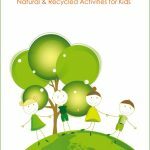 If you’re a regular reader then you’ll know that we often have crafty playdates with some of my son’s friends, and the two girls LOVE all things princess and sparkly. They’re 5.5 years and 7 years old – so it’s no surprise. I made “Princess Slime” for them a year ago in their favorite pink and purple colors. I thought it was about time I celebrated their love of a certain movie-that-shall-not-be-named* with this sparkly play dough. 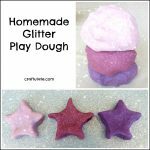 I made a double amount of my usual homemade play dough recipe, adding copious amounts of silver and light blue glitter, and a tiny amount of blue neon food dye. I also found some silver holographic glitter in my craft supplies which made it extra shiny and reflective. 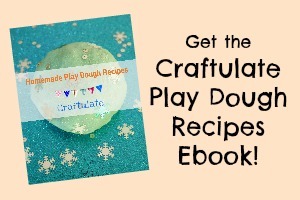 The kids all played with the dough in different ways (my son was nowhere to be seen)! Then it occurred to them that this dough reminded them of something, and ran off to grab some figurines from a popular movie. If you happen to know which one, please do tell me, because I absolutely have no idea. None at all. * The girls made up little scenes – it was great to watch! *I apologise for my frequent random references to a certain movie – but I requested permission to use “FrXXXn-Inspired…” in my post title from the maker of that movie, but was denied. It wasn’t going to stop me writing this post and you all know what I’m talking about anyway!